Now you can get your hands on this amazing jack and receive a free saddle cushion to go with it. That's a $24.00 savings! 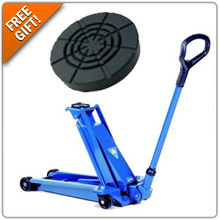 Come see why the AC Hydraulic floor jack is the last jack you'll ever own. Click HERE to redeem the Free Gift! Last day to take advantage of savings! Promo ends at 11:59pm PST.